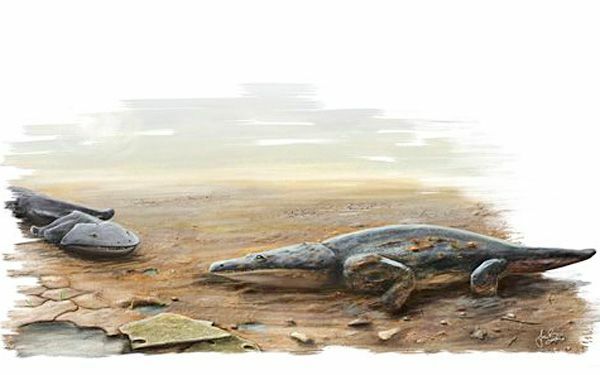 Fossil remains of a previously unknown species of a crocodile-like "super salamander" that grew as long as a small car and was a top predator more than 200 million years ago have been found in southern Portugal. The species grew up to six feet in length and lived in lakes and rivers, University of Edinburgh researchers said. 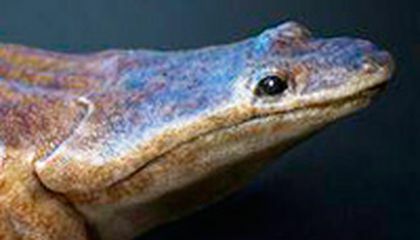 The team said the species has been given the name Metoposaurus algarvensis. It was part of a wider group of primitive amphibians that were widespread at the time but became extinct. They are the ancestors of modern amphibians such as frogs. They are believed by paleontologists to have lived at the same time the dinosaurs began their dominance. Steve Brusatte of the University of Edinburgh's School of GeoSciences led the study. He said the new species, which had hundreds of sharp teeth, is "weird compared to anything today." It was at the top of the food chain, feeding mainly on fish. But it was also a danger for newly appeared dinosaurs and mammals that strayed too near the water, Brusatte said. The dig began in 2009 and took several years. The "super salamander" bones were uncovered in a half-meter thick layer of rock in a hillside that is "chock-full" of bones, Brusatte said. The team hopes to raise funds to continue excavating the site. That is so weird that there is a super salamander that is as long as a small car. If I was to see one I would run or something. I also think that its cool and different because we know that salamanders are small creatures.